This Excel spreadsheet calculates the equilibrium water content of natural gas. It uses a correlation derived from the McKetta-Wehe chart. Originally published in 1958, the McKetta-Wehe chart is widely accepted in the natural gas industry. There are several restrictions inherent to the McKetta-Wehe chart. This chart is suitable for sweet natural gas with a mole fraction of methane of more than 70%, and a relatively small fraction of heavy hydrocarbons. 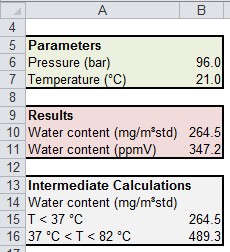 Water content is overestimated at pressures of 70 bar absolute and over. The correlation is not suitable for natural gas in equilibrium with gas hydrates. The water content of these is a complex function of their composition and time. Thus few reliable correlations exist, and thermodynamic models are usually used. The McKetta-Wehe chart should only be used at temperatures below which hydrate would form.